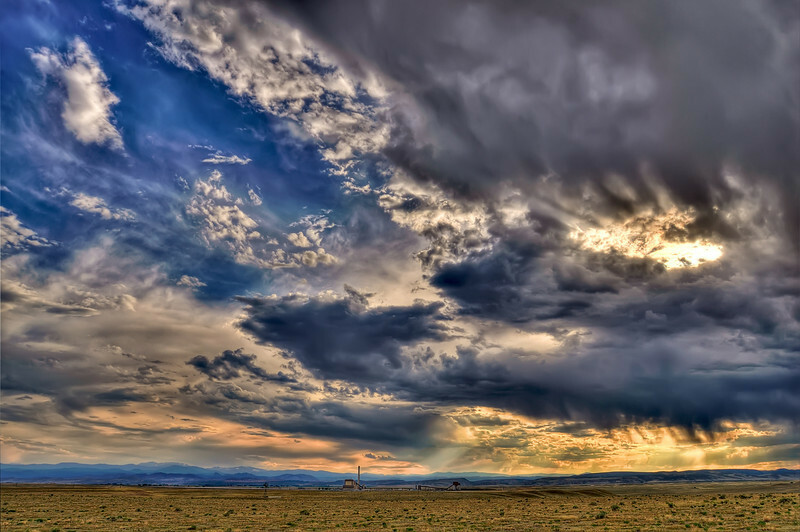 Image Notes: This intense cloud-laden high contrast scene with an incredibly wide dynamic range made for a perfect excuse to do some HDR. This photograph is based on 7 exposures 1EV apart (-3EV - +3EV), merged in Photoshop & then tone-mapped with Photomatix for contrast/luminosity and tone-mapped in Dynamic Photo HDR for color. These two resulting HDR files were then layered on the 0 EV exposure and blended down, the Photomatix one primarily in luminosity mode and the Dynamic Photo-HDR on color. Finally, I made a copy of that file and converted it to 8bit where a slight bit of LucisArt was applied to bring out extra cloud details (1 pass exposure at 60% and faded on luminosity at 45% opacity and 1 pass Wyeth at 40% and faded on luminosity at 25% opacity). The LucisArt image was then placed back on the 16bit working file and blended down at around 70% opacity. That's the main workflow. One other key ingredient was Noiseware Pro which was applied on a surface mask to protect detail.